Prada Candy L'Eau ($68-$88, Sephora, Nordstrom), is a fairly new addition to Prada's fragrance lineup. Supposedly a lighter, fresher version of Candy, Candy L'Eau is a zestful, elegant composition with notes of White Musk, Benzoin, Caramel, Citrus and Oriental Florals. I love the original Prada Candy - its my favorite fall scent (probably one of my favorite scents ever - so much that I bought a full size as soon as I ran out of the teeny tiny vials I had) that I could actually wear even in the spring and early summer. Candy L'Eau, while described as a lighter version, is definitely something I wouldn't wear any other season than fall. Its lighter, yes, but not as zesty as its thought out to be - I get a lot of the musk and only a hint of caramel as it dries down. The opening is quite soft, I do get a bit of the powdery florals, but its definitely more musky and much less sweeter than the original Candy. It still is quite a sophisticated scent, and the staying power is pretty good. 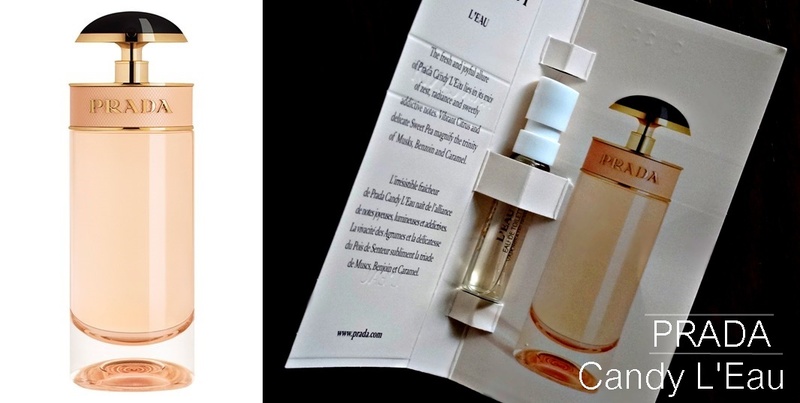 Candy L'Eau's bottle design is just as beautiful as Candy and if you are looking for a fall scent, but found Prada's Candy a little too sweet, do check this one out! As for me, I would choose Candy over Candy L'Eau. Have you tried Prada Candy L'Eau? I have sprayed Prada Candy on me once, but still don't know what to think about it. The dry-down was a bit odd for me.. I have a sample vial that I will try again tomorrow! I usually don't like citrus-y scents so I don't think I will like this version either! I gave this a sniff in store and I agree with you - I'd choose the original (which I also LOVE and have been wearing every day lately) over this one.